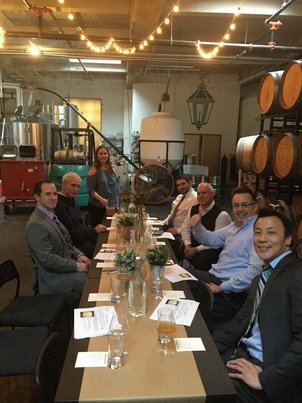 During a rainy evening on Thursday, May 26, the Chemical Patent Practice Committee held a “meeting” (i.e., beer tasting) at Lamplighter Brewing Company in Cambridge. Lamplighter provided a tour of their facility and brewing process, followed by samplings of their terrific beer. During the tasting, John Keyes gave an informative presentation on the history, science, and intellectual property of beer making. Pictured, standing, is our gracious hostess during the tour. To her right, sitting, in counterclockwise order: Alan Sherr of Brown Rudnick; Evan Jones, Ph.D. candidate, Harvard University, Lab of Prof. Daniel Nocera; Dominic Yee of Jones Day; W. John Keyes of Sunstein; Rob Tosti of Brown Rudnick; and Jake Tosti, summer associate at Bowditch & Dewey, and Suffolk Univ. Law School student (class of 2018). Snapping the picture is Kevin Henry of Intarcia Therapeutics.